This week in Not So Long Ago, GM stops by M St. and Potomac. Nowadays its home to Jonathan Umbel’s two successful restaurants, Hook and Tacklebox (or what a friend of GM calls, respectively, “Fish” and “Lobster”). 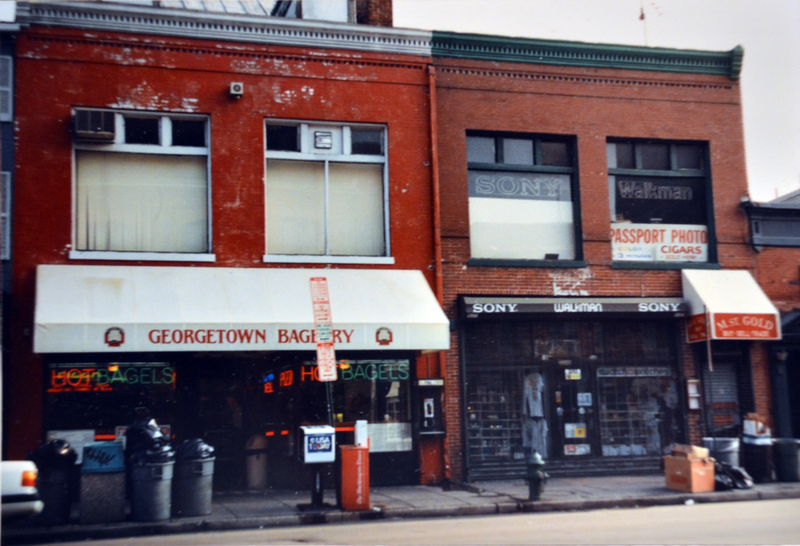 Eighteen years ago, the Tacklebox space was occupied by the dearly beloved Georgetown Bagelry. This bagel shop opened up shop on M St. in the 1980s. It stayed open here until 2007 (or maybe 2008, GM can’t quite remember). True devotees can still get their Georgetown Bagel fix at the remaining Bethesda location. (GM also thinks he heard once that Booeymonger carried them too, but he’s not certain about that). Next door, it appears that in 1993 the space was occupied by an electronics store and a jewelers. These stores were eventually replaced by Cilantro, a Spanish tapas restaurant. Cilantro itself closed up shop in 2007 to make room for Hook. A while back, Jonathan Umbel floated the idea to purchase the cigar store next to Tacklebox and turn it into a high end butcher. The plans for the property sale fell through and Umbel gave up on the idea. Of course, after the recent fire, Hook and Tacklebox are out of commission indefinitely. So Umbel obviously has other things to worry about than further expansion. I hate it when property owners paint brick. This building once housed Meenehan Hardware, begun by John Meenehan and carried on by his son Frank for years and years. John Meenehan was known throughout the District as “Meenehan, the Hardware Man.” Meenehan hardware store closed in 1983. From 1935 until 1980, Mr. Meenehan managed the store at 3241 M St. NW in Georgetown, where his customers included senators, judges and other high federal officials. 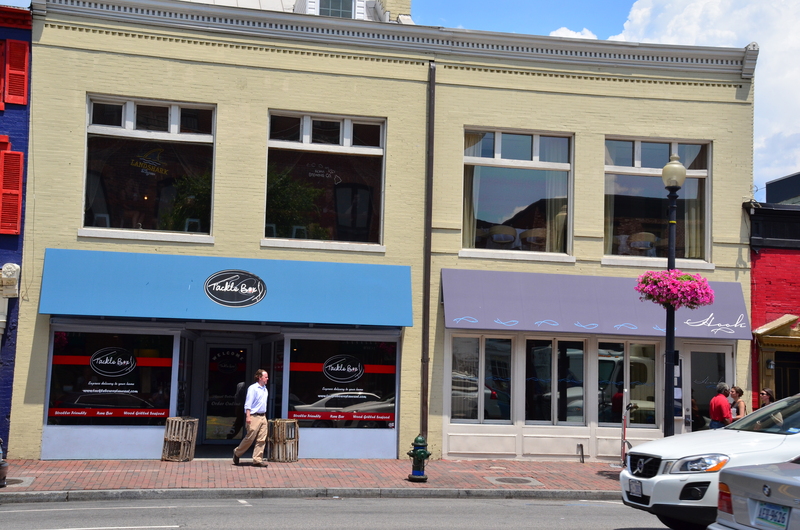 Furin’s carries Georgetown Bagelry bagels. On Saturday and Sunday, Scheele’s Market has fresh Georgetown Bagelry bagels. Alas, the bagels at Booeymonger are not Georgetown Bagelry. They are from Whatsa Bagel. Just stumbled upon this piece. Yes, Meenehan’s Hardware stood proudly on M Street, address 3241. My father, John, started the business in 1921 with his father (also John) over on 14th Street. Over the years, John ran the business with his brothers Frank and Vincent. Both brothers left the business and by the time the store on M Street closed in 1983, John and his sons Patrick and John (aka, Bo) were involved in the business, as well as my sisters, Kathleen and Terry and my mom. The stores Virginia locations continued for awhile, but are now closed. Yes, the customers included dignitaries, college students, local business owners and Redskins. I sometimes think that every valuable lesson, I learned working at that store.